Cold PDO period and US summer temps? Produce those same winter and summer maps for 1978 to 1989. Cold amo and warm pdo. I want to see that combination as that is the one I have been on about. So Tom, Cambium, any thoughts when looking at decadal swings of the PDO and temperature trends for the summer and winter in the US? Looks like you are agreeing from your map, no? Showing a colder map with a +PDO. But your including all years from 1979 to 2007? That's not really using the analog correctly because you're using years it was Cold AND Warm and just so many other combos and drivers of patterns. Way too big of a range. Even a Negative PDO doesn't help you. Here are all the years with a Negative PDO and what June looks like. Normal for us. No real heat. And notice... Negative PDO = cooler West. That's because a trough is able to develop in the West. You would think the East would have a ridge. Not all the time. You're using the analog wrong. You are including years there was a warm PDO. Using an Average of 1947 to 1978? Come on. I mean using the years that you found, Poisitive PDO means this. This doesn't look like a hot pattern to me. Only in the west and locally in other regions. You can't fight science... A +PDO means Ridge in Eastern Pacific....Unless the U.S is zonal all the way across,, no ridge can get sustained East of Rockies aside from the Southeast one. Cambium I was going to say the same thing. Use 1978 to 1989 warm pdo and cold amo. A wicked combo for the east and particularly the southeast. What is interesting to note is that when the blob was around, it was further offshore than the warm pdo, and it produced much more cold in the midwest than the east (though still cold in the east also). Then the blob shifted onshore to create the warm pdo, and the subsequent ridge moved east and I think the cooler weather shifted east in 2015. I think the warm pdo hits the east coast more than it does the midwest, and george is onto something there I think. You're using the analog wrong. You are including years there was a cold PDO. Using an Average of 1947 to 1978? Come on. Well yes there were years when the PDO flipped within a longer decadal trend. I know this. But OVERALL, I'm looking at decadal trends here..... The period of 47-78 we were in a negative PDO right? I'm just looking if these oscillation alone influence our climate in the long run. I'm not seeing the images, and I'm not fighting science. I'm demonstrating that looking at the PDO and the AMO alone, doesn't tell us much. That's why a combination of factors have to be looked at in context. We can't make blanket statements that, "oh, warm PDO means cold winters for the eastern US" because that isn't always true. 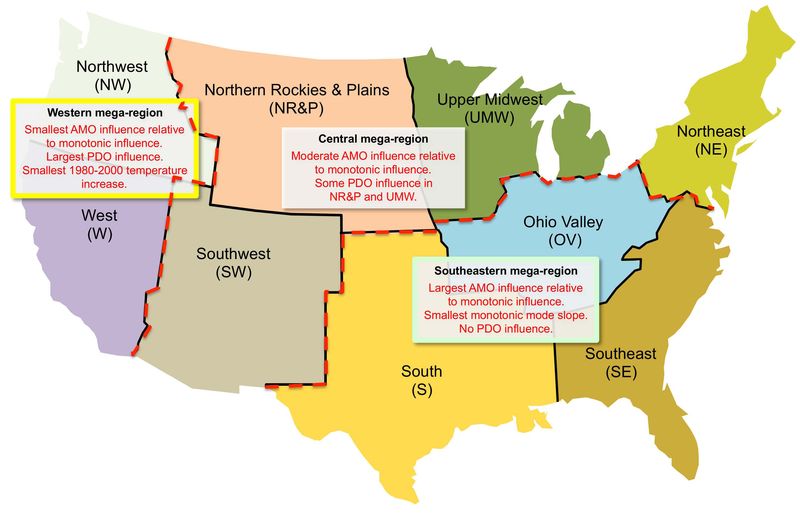 The defining characteristics of the mega-regions are: Southeastern – dominated by the AMO, no PDO influence; Central – influenced by the AMO, no PDO influence, Northwestern – influenced by both the AMO and PDO. Ok here you go... Warm PDO didn't seem to warm the PNW during those summers. Where's that western ridge as a result of a warm PDO? . We were warmer in the summer. And during the winter everyone was colder? Thought the +PDO was supposed to keep the west coast milder in the winter too? Last edited by chicagogeorge; 05-17-2016 at 09:32 AM..
That's a crazy comment. Don't care what paper you show. Of course "Not alone". NOTHING alone does. but to even consider it doesn't play a major role is nuts. I don't even know how to respond. Just look at the 500mb maps, watch the flow of things is all I can say right now. Unless the Earth starts rotating the other way, what happens in the Pacific guides what happens in the U.S. Current WV loop. See the push West towards British Columbia? That in turn is helping dig a trough over the Rockies which is pushing up a ridge in the East. I don't know what to tell you. This study states that changes in the AMO were a bigger factor over more of the US. Temperature vs. time curves calculated by combining the separate monotonic and oscillatory modes agree well with the measured temperature time series, indicating that the 1938-1974 small decrease in contiguous U.S. temperature was caused by the superposition of the downward-trending oscillatory mode on the upward-trending monotonic mode while the 1980-2000 large increase in temperature was caused by the superposition of the upward-trending oscillatory mode on the upward-trending monotonic mode. The oscillatory mode, mostly representing the AMO, was responsible for about 72% of the entire contiguous U.S. temperature increase over that time span with the contribution varying from 86 to 42% for individual climate regions. Thank you for those maps. I have been trying to prove a point to the guy in upstate NY what those winters were like and his constantly saying they weren't bad. They were terrible for us both summer and winter. I should know I lived thru it even though I was young. It was freezing freezing cold in the winter. And a friend of mine from SW Minnesota showed me pics of what that period was like for him growing up and waiting for school buses. It was simply brutal. Bottom line is that Bastardi is right when he says cold amo and warm pdo will wreak havoc on the US just like it did in the 1980's. Not very good summers, and brutally cold winters by and large. Of course La Nina and El Nino will mitigate things, but by and large that combination is wicked. The PNW is certainly not as cold as were were based on the anomaly graphics you show. They look a little below avg though not nearly as much as the East. The warm PDO helps them certainly more than a cold PDO would. Thank you for those maps. I have been trying to prove a point to the guy in upstate NY what those winters were like and his constantly saying they weren't bad. They were terrible for us both summer and winter. I should know I lived thru it even though I was young. It was freezing freezing cold in the winter. And a friend of mine from SW Minnesota showed me pics of what that period was like for him growing up and waiting for school buses. It was simply brutal. Yes, a combination of factors brought us very cold winters during that time period. But, like I've been telling you all along, a PDO by itself doesn't effect me much. I mean look at the Midwest during the summer at that time period with a +PDO..... Where is that trough that's supposed to be hammering me that you have been screaming about? Why am I above average in the summer during this period and you below average? Apparently the AMO is a more important driver and/or other factors come into play. In general, McCabe and his coauthors suggest that large-scale droughts in the United States are likely to be associated with positive AMO -- the kind of warming of sea surface temperatures that occurred over the North Atlantic in the 1930s, 50s, and since 1995. But wouldn't those maps that show cooling in the west even with a +PDO suggest that the -AMO may have played a role there too? Otherwise why would they be cooler than average when the PDO was positive? Winter anomalies not as evident out west, but ironically still, the PNW is below average with a +PDO/-AMO (and your friend in Minnesota had near average winters) using this base period. Last edited by chicagogeorge; 05-17-2016 at 10:24 AM.. He has said this recently upon going back there now with the winters they have been having recently. Certainly when you compare the recent winters there with the winters he had it was much colder. An avg winter there is pretty bad, so compared to the warmer winters now he has a point. I don't agree at all that the warm PDO has no influence on the SE. Look at what the blob did to them in 2014 and 2015. Also, the 80's there had multiple years with very extreme low temps for the region. For people with gardening interests in the South, nothing matches the 1980's. Maybe they don't have sustained cold in the warm PDO, but some of the arctic air masses go very deep in a warm PDO. Something had to cause 3F in Mobile, AL or 6F in Savannah in the 80's. Savannah averaged USDA growing zone 7b (5 to 10F) for a number of years in the 80's. That is why so many palms were killed off.